^ Born on 24 February 1753: Henri-Pierre Danloux, French artist who died on 03 January 1809.  Orphaned at an early age, Henri-Pierre Danloux was raised by his uncle, an architect. Around 1770 he studied under a genre painter and a history painter. He followed one of them to Rome in 1775 and then traveled throughout Italy. Unlike most of his contemporaries, Danloux preferred drawing the Roman countryside and portraits instead of ancient monuments. Settling in Lyon, France, in 1783, Danloux established himself as a portraitist in the relaxed, informal manner of Jean-Baptiste-Siméon Chardin. After moving to Paris in 1785, Danloux's reputation grew as a portraitist to the aristocracy. Danloux paid great attention to rendering fabrics, embroidery, and accessories in both oils and chalk. After another sojourn in Rome, Danloux returned to Paris in 1789, where he was commissioned to make portraits of the royal family. Soon the French Revolution forced him to flee to London. Influenced by fashionable English portrait painters like George Romney, Danloux excelled in family groups and portraits of children, whom he captured in natural, spontaneous poses. He also began painting history subjects. He returned to Paris in 1801 and spent his remaining years frustrated by his failure to establish himself as a history painter. ^ Died on 24 February 1911: Jules-Joseph Lefebvre, French Academic painter born on 14 March 1836. 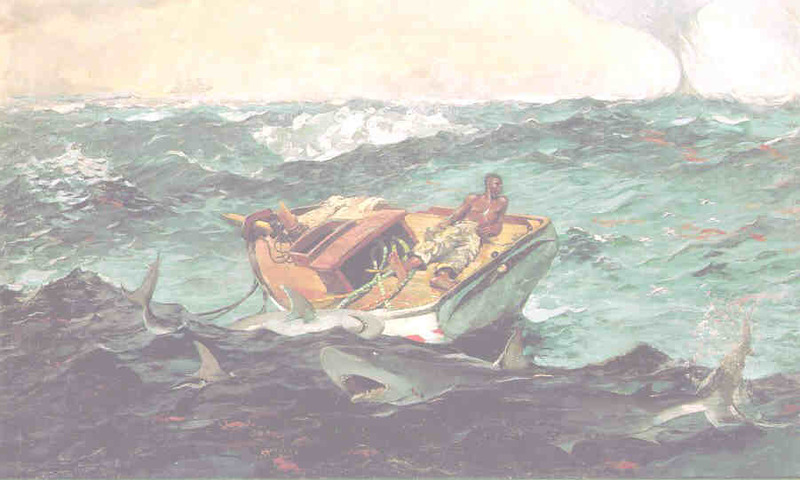 ^ Born on 24 February 1836: Winslow Homer, US painter who died on 29 September 1910.  Born in Boston, Homer became a painter whose works, particularly those on marine subjects, are among the most powerful and expressive of late 19th-century US art. His mastery of sketching and watercolor lends to his oil paintings the invigorating spontaneity of direct observation from nature . His subjects, often deceptively simple on the surface, dealt in their most serious moments with the theme of man's efforts to establish his humanness in the face of an indifferent universe. Homer died on 29 September 1910.  American painter, born in Boston. After apprenticeship to a lithographer (1855-57), he began his career as an illustrator for magazines such as 'Harper's Weekly' (1859-67), and specialised in watercolours of outdoor life painted in a naturalistic style which, in their clear outline and firm structure, were opposed to contemporary French Impressionism. He spent two years (1881-83) at Tynemouth, England, and on his return to America continued to depict the sea at Protus Neck, an isolated fishing village on the eastern seaboard, where he spent the rest of his life. His work was highly original, and is often regarded as a reflection of the American pioneering spirit.  Works considered by some to be the most powerful and expressive of late 19th-century American art. Master of sketching and watercolor. Oil paintings are brought alive by the invigorating spontaneity of direct observation from nature. Themes often include man's efforts to establish his humaness in the face of an indifferent universe. Born into an old New England family and enjoyed a happy country childhood. Mother was an amateur painter. At 19 he was apprenticed to the lithographic firm of John Bufford in Boston. Within a few years he was submitting his own drawings for publication in such periodicals as Ballou's Pictorial and Harper's Weekly. In 1859 he moved from Boston to New York City and began his career as a free-lance illustrator. The next year he exhibited his first paintings at the National Academy of Design. During the Civil War he made drawings at the front for Harper's. Unlike most artist-correspondents he dealt most often with views of everyday camp life. As the war continued, he concentrated more and more on his painting. In 1865 he was elected to the National Academy of Design. Although his studio was in New York City, the city was rarely figures in his work. During the warmer months he traveled to Pennsylvania, the Hudson River valley, and New England, to go camping, hunting, fishing, and sketching. In 1866 he travelled to France for about a year. In Europe he was influenced by French naturalism, Japanese prints, and contemporary fashion illustration, but his work upon his return to America had not changed markedly. However, the pictures were generally somewhat brighter. In 1873 Homer began to work in watercolor, which allowed him to make quick, fresh observations of nature. He explored and resolved new artistic problems. From the late 1870s Homerdevoted his summers exclusively to direct painting from nature in watercolor. Greater concern for atmospheric effects and reflected light added complexity.  The Gulf Stream (1899) [below] stands at the apex of Homer's career. A Black man lies inert on the deck of a small sailboat. A hurricane has shredded the sails, snapped off the mast, and snatched away the rudder. Unlike the boys in Breezing Up or the fisherman in Fog Warning, this man is powerless to control his vessel. He is at the mercy of the elements. Sharks circle the boat, a waterspout hovers in the distance, and a boat on the distant horizon passes by unseeing and unseen. As in Stephen Crane's comparable short story, The Open Boat, nature is seen as not caring whether a man lives or dies. 1920 Paul Albert Girard, French artist born on 13 December 1839.  Relative? of Marie-François-Firmin Girard [1838-1921]? 1910 Osman Edhem Pacha Zadeh Hamby-Bey, Turkish artist born in 1842. 1839 Caspar Johann Schneider, German artist born on 19 April 1753. 1819 Jean François Sablet le Romain, Swiss artist born on 23 November 1745. 1844 Raffaelo Sorbi, Italian artist who died on 19 December 1931. 1684 Matthys Balen, Flemish artist who died on 07 January 1766.